Unfortunately, over the last month I had to visit a few different funeral homes. On one visit, my husband asked why funeral homes always resembled a house. Knowing a bit about the evolution of how we handle death in America, I explained that it is because a wake or viewing used to take place within the person’s home. Funeral “parlors” or “homes” are intentionally designed to resemble the parlors in homes where we once laid out our dead for visitation. This question led me to revisit some of my old studies about death in America and how handling the dead went from being a very personal and hands-on experience for the survivors to something that is handled by professionals outside of the home. As genealogists, we often note the death dates of our ancestors without much thought of what the family was going through at the time of the death. We read obituaries that illustrate lifetime accomplishments, notes of their character, and sometimes a description of how the person died, but we do not stop to consider that the way our ancestors processed death was very different from the way we approach it today. Before the mid-nineteenth-century, families prepared their own dead for burial. This required bathing and dressing the deceased; it was a very intimate experience for the surviving family members. It seems likely that this became a part of the mourning process as well. Individuals learned how to care for the dead from observation and being a part of the process within their own homes. Death was also accompanied by long periods of public mourning, displayed by wearing black clothing or other mourning symbols. 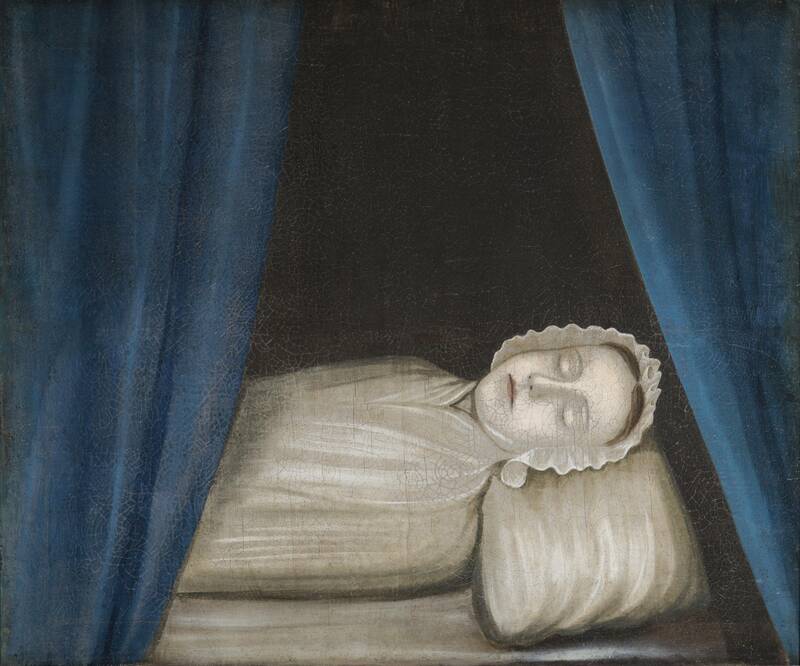 It was not uncommon to have portraits done or take photographs of the dead laid out in the home. Death was personal, intimate, and hands-on for the survivors. Individuals learned how to care for the dead from observation and being a part of the process within their own homes. Embalming changed this process in America starting with the Civil War, when soldiers needed to be sent home for burial. The idea of embalming and the modern funeral gradually became more popular. Families were no longer responsible for preparing a loved one for burial and bodies were removed to funeral homes shortly after death to be washed and sterilized for viewing. By 1882, the first school dedicated to educating professionals in the field was established at the Cincinnati College of Mortuary Science. The practice became even more professional in nature with the National Funeral Directors Association, which established itself as a group of professionals contributing to public health. The rise of funeral homes also coincides with the rise of hospitals, places where the sick and dying go for hope of treatment. When deaths occur within a hospital, the body is then removed to the care of a funeral director and never returns home. The modern way of death can be viewed as sterile and impersonal, leading some to argue that it has been detrimental to the way we approach death and mourning. Advocates for a more natural and personal approach often align with the so-called “Death Positive Movement” and suggest skipping the embalming process and burials in biodegradable coffins (or no container at all), among other practices. The professionalization of death has certainly benefited genealogists, with over 130 years of paperwork created by funeral homes. For better or worse, the prominence of funeral homes has shaped our relationship to death and has removed survivors from the need to intimately handle the dead. Still, some expectations remain the same. Even though it has been several generations since it was commonplace to present the dead within your own home, we still expect and appreciate the “homelike” environments that funeral homes strive to create as a place to say our final goodbyes. Interesting report. I remember my grandmother being “laid out” in the front parlor in PA where it was kept very cold. We each had to take a turn during the night sitting in that room with the body in the casket. It was a surreal experience for a child. My dad was a wonderful storyteller, blessing me with so very many stories of his family and his life. He often spoke of the time, in 1935, when he was 13 years old and his father had just died. The body was laid out in the living room of the farmhouse, and many friends and family members came and gathered in the kitchen. Over the several days, his mother would eventually tell him that he had to go upstairs to bed. That meant he had to walk through the living room, past the open casket, to go up to his bedroom, which was directly above the living room. He was absolutely horrified by the whole experience of living with his father’s body in the home. He always ended that story by saying that, in his opinion, funeral homes where the best invention that had come about in his entire lifetime. Considering how many things have been invented since 1935, that was a really amazing–and totally heartfelt–statement. So true. I read a letter by a father who described holding his daughter’s hand as she died, and that there were no women in the house to tend to her after death; the neighbors had to wash and prepare her. I believe we are now experiencing another sea change in the manner in families deal with death. Funerals and funeral homes have gotten so very expensive that most cannot afford these services. Caskets, whether wood or metal, cost thousands and these limited resources are not recycled. Embalming requires the use of the very most toxic chemicals–deadly to the embalmer and requiring burial vaults to protect the soil and water table. I understand that nearly 50% of people are now cremated, which eliminates the opportunity to look death in the face even after the fact. For my own 84yo Irish father I held an 8 hour Friday night Wake at a banquet hall, with Mass and interment the next day. Well over 100 attended because we made it easy enough to do so. The only paper trail will be his death certificate, a long obituary, and the tree we worked on together for some 4 years. One of the most touching memories of a tour of the Hebrides was watching men of a village parade slowly through the town, casket on their shoulders. A solemn goodbye. Would you tell us where in the Hebrides? Both my paternal and maternal grandparents were Irish immigrants who settled in Bridgeport, CT. I have noticed from reading their obituaries, and those of their children, my father’s and mother’s cousins, that waking them at home seemed to persist well into the 20th century. Both my paternal grandmother and maternal grandfather, who died in 1939 and 1940 respectively, were waked at home. However, when my maternal grandmother died, in 1951, her wake and funeral were handled by a funeral director (although I believe he was a cousin of the family). Thank you for this post. In my family my grandfather, who died in 1935, was the last waked at home. A family member prayed next to the body through the nights, and the wake back then was held on three successive afternoons and nights. One month after the funeral mass and interment, there was a “month’s mind” mass, where family and friends prayed again for the repose of the deceased’s soul. Black was worn by women in my Irish family for a year. One man at work asked my mother, “Don’t you have any other clothes?” He was taken aback when she told him why she would be wearing black for many more months. Thank you for this post, which has added texture to my thoughts about the deaths of my ancestors. Very good article. I was told my grandfather’s wake was held at home. They said casket was too large to go through the door so it had to be brought in through a window. The home I grew up in was the place for the wakes of my grandmother, an aunt and both of my parents. I was 7 for the first, 9 for the 2nd, 13 for my father and 16 for my mother. The remains were prepared by a family acquaintance but the 2 day wakes were in the living room. I was sent to a family member for the first 2 but stayed with the casket for each of my parents. The last one was in 1956, in a major eastern city. Family members, including me, continued to live there until 1973. It seems strange now but was normal at the time.